Here, in the Northeast, the leaves are starting to change. Hear the subtle crunching as you walk outside. Gracefully, they float down from the heavens like orange and yellow snowflakes. Although the air is crisp, the colors will soon illuminate the vista with brilliant warmth. Do you look at the different shapes and try to identify what tree they are from? What tree is common in your area? I made four watercolors, and then turned them into postcards. Feel free to check them out at my store. White Oak hardwood trees grow throughout the central and east part of North America, ranging from Texas up to Maine, also reaching up to Canada. They are described as white oak due to their bark being white-ish, in comparison to their oak cousins. Its acorn nuts provide an important food source for deer, squirrels, blue jays and turkey. A distinct identifier of the white oak is its leaf shape which has seven to nine rounded lobes. While biking through a park, I come across a pile of giant leaves. I believe it is called a Sycamore. It is big enough to cover my head from the sun. 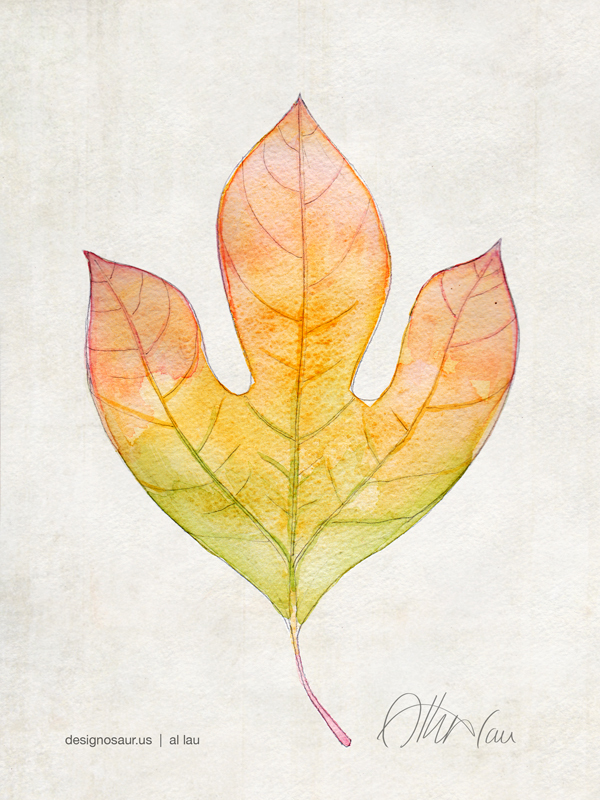 My watercolour of the Sycamore leaf shows it in all of its Autumn spikiness. 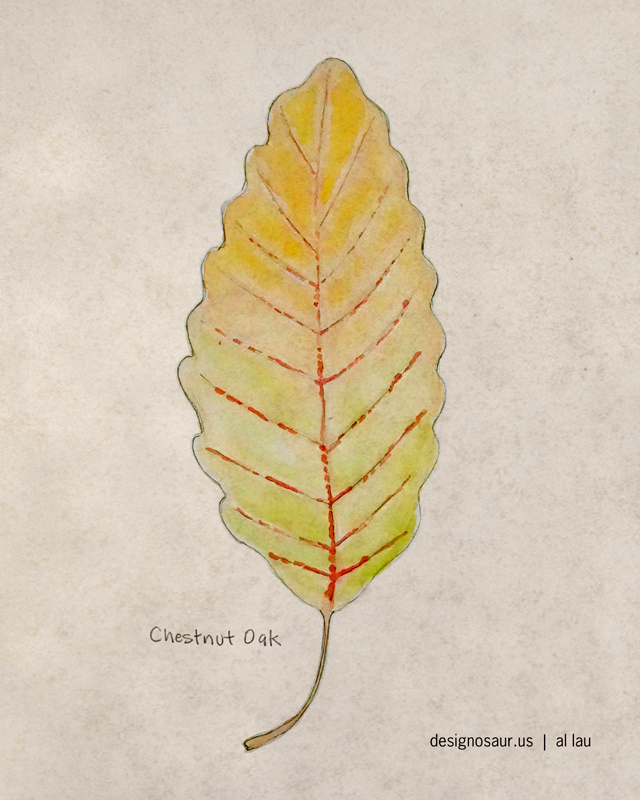 To continue my series of fall leaves from last year, I made a watercolour of a Sassafras leaf I found while hiking. I love the way they are shaped like dinosaur tracks in the mud. The Chestnut Oak tree is native in eastern North America. from Mississippi to Maine. Wildlife, such as blue jays, woodpeckers, squirrels and deer rely on acorns of the oak tree as a source of their diet. The average life span of an oak tree is 60 years. 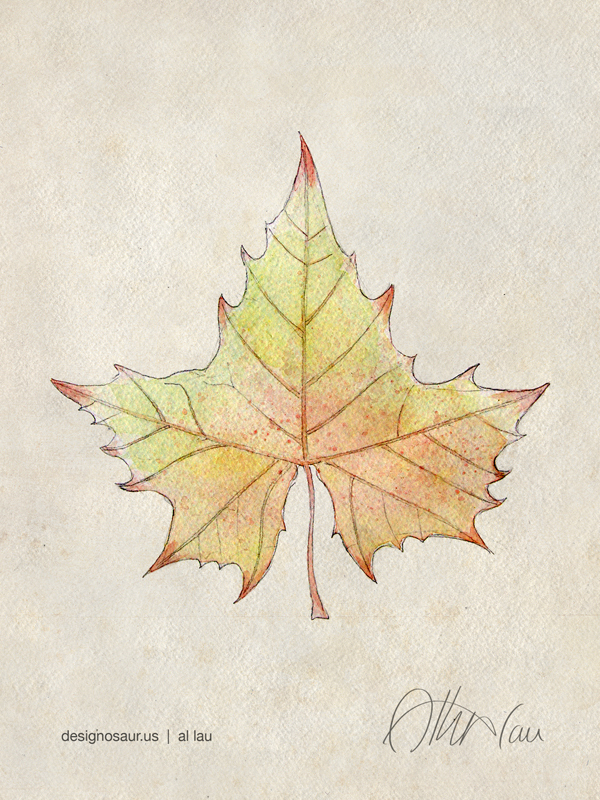 Here is my painting of an autumn leaf from a maple tree. 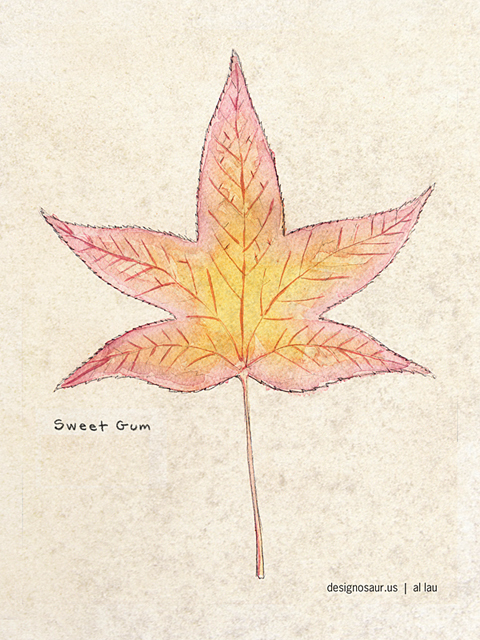 Watercolor painting of an autumn leaf from a Sweet Gum tree.